Heat oven to 350°F. Bake loaves as directed on can; cool 20 minutes. Cut about 1 1/2 French loaves into 1/2-inch cubes to make 7 1/2 cups. Reserve remaining 1/2 loaf for another use. Increase oven temperature to 375°F. 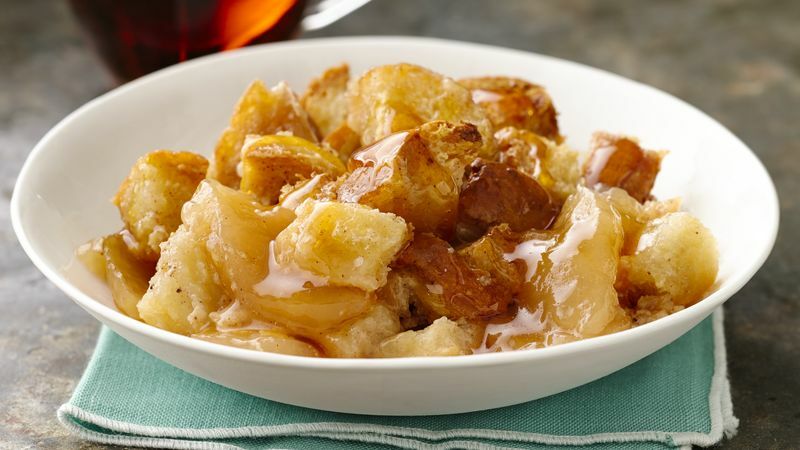 In 13 x 9-inch (3-quart) glass baking dish, evenly layer melted butter, apple pie filling and bread cubes. In medium bowl, stir sweetened condensed milk, apple pie spice and vanilla until well blended. Pour over bread, pushing bread down to absorb liquid. Bake 25 to 35 minutes or until deep golden brown and bubbly. Cool 15 minutes. Serve warm with maple syrup.